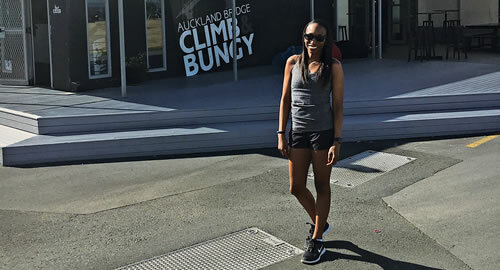 Lauren Beverly poses in front of Auckland Bridge Climb Bungy prior to jumping off the bridge in New Zealand’s largest city. Photo courtesy of Lauren Beverly. Would you want want to ride an 85 mph rollercoaster? What about jump out of a perfectly good plane? Or take a leap from a bridge? For Dallas attorney Lauren Beverly, the answer to those questions is an emphatic yes. Early trips to the fair in Tennessee with her father served as the seed for a thrill-seeking lifestyle. Beverly is all business in the courtroom, so it often comes as a surprise when colleagues discover she enjoys bungee jumping, skydiving, and spending her leisure time living life on the edge. When did you realize that you were a thrill-seeker? I don’t think there was a precise moment when I realized I was a thrill-seeker, but I think it started when I was a little girl. My dad would take me to the Mid-South Fair in Memphis, Tennessee, every year and I loved going on all the rides. I think my thrill seeking progressed from rides at the fair to rollercoasters and then skydiving and bungee jumping. Beverly at the top of the recoil from a jump. Photo courtesy of Lauren Beverly. You love rollercoasters. What are some of your favorites? What are the highest and/or fastest coasters you’ve been on? My love of rollercoasters started as a kid. My favorite growing up was an old wooden one called the Zippin Pippin at a theme park in Memphis called Libertyland, which I think closed about 10 years ago. The rollercoaster was supposedly Elvis’ favorite ride. A current favorite is MR. FREEZE: Reverse Blast at Six Flags Over Texas in Arlington. The ride blasts off backwards at 70 mph and you don’t know when it’s going to start, so the anticipation is one of the best parts of the ride. I think the fastest rollercoaster I’ve been on is the Titan, which is also at Six Flags Over Texas, at 85 mph. 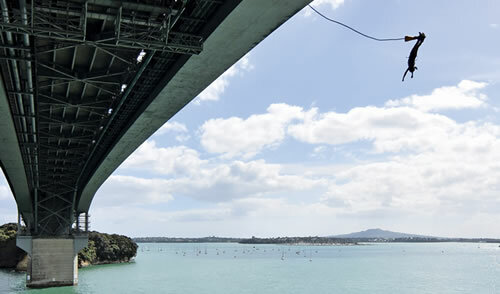 Beverly on the descent of the bungee jump from Auckland Harbour Bridge. Photo courtesy of Lauren Beverly. Being buckled into a rollercoaster is quite different from having a parachute strapped to your back. What made you decide that you’d rather jump from a plane than wait for it to land? My twin sister randomly asked me one day if I wanted to go skydiving. We looked up the closest place to jump near us in Memphis, and then we were off jumping within the next few days. How many times have you skydived? Where do you usually go? What’s your highest jump? I have skydived three times. The first time I went was with my sister in Memphis when we were 18. The other two times I jumped were at Skydive Spaceland Dallas. I’m not sure how high the jump was in Memphis—either 13,000 feet or 14,500 feet depending on which plane I jumped from—but the jumps at Skydive Dallas were from 14,000 feet. You’ve also gone bungee jumping. What is your favorite spot? 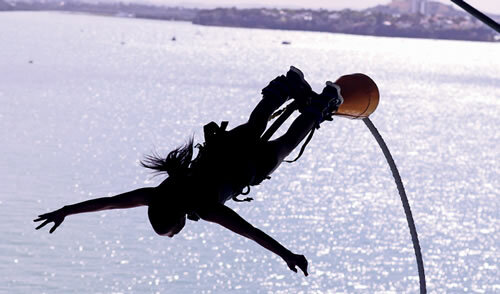 The first time I bungee jumped was at Zero Gravity Thrill Amusement Park in Dallas about eight years ago. However, it was just a small theme park so the jump wasn’t that high. My favorite spot would have to be in Whistler, Canada. The scenery was absolutely gorgeous, and it was the highest jump I’ve done at 160 feet. A close second, however, was my jump in Auckland, New Zealand. One of the items on my bucket list was to jump off a bridge overseas, and I was able to do that when I went to Auckland in December 2017 and jumped from the Auckland Harbour Bridge. There was an option to have a “touch” bungee, which is when your hands touch the water, but I decided not to opt for that after choosing that option when I went bungee jumping in Cancun, Mexico, and ended up hav-ing half of my body submerged! 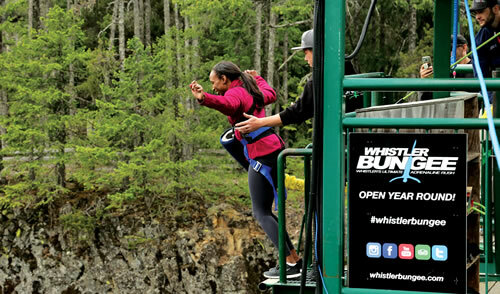 Beverly preparing for her highest jump to date in Whistler, Canada. Photo courtesy of Lauren Beverly. Do you ever find the thrill-seeker in you coming out in the courtroom?